Courage, power, superpowers... are the things all superheroes have in common but... what makes them unique? Their clothes! If you want to feel unique and different we have the most original superhero T-Shirts. All styles, all superheroes, only at Funidelia! Many styles of Marvel shirts with symbols and images of your favourite superheroes: Captain America, Spiderman, Deadpool...shirts. 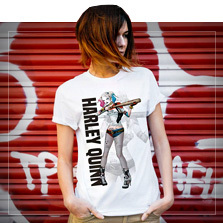 Also many DC Comics T-Shirts like Harley Quinn, Superman, Batman or Wonder Woman shirts. Show off the Captain America star on your chest, the "S" from Superman, the bat from Batman or the spider from Spider-Man and make sure everyone knows who your favourite superhero is. So if you love to help the weak, fight for justice or fight against villains... you need a superhero costume in your size. Are you looking for a superhero shirt to give as a present to a Marvel or DC Comics fan? Superpowers, a "catchy name", a secret lair, a faithful friend to tell your secrets to... What is missing for you to turn into a real superhero? Your uniform! Grab one of our original superhero T-Shirts. 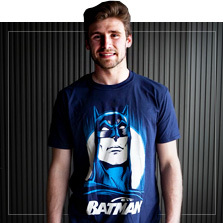 Think about your favourite superhero and choose a T-Shirt that you like the most. Will it be a Marvel or a DC Comics T-Shirt? Captain America or Superman? Batman or Harley Quinn? A hero or a villain? We know that you cannot decide and that is why we have brought you the biggest superhero T-Shirt catalogue. If you are looking for an original present for a superhero comic fan you only need to think about what superhero they like the most in order to find the perfect T-Shirt for him or her.